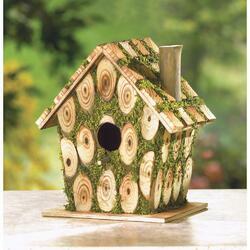 This is knot your ordinary birdhouse! Charmingly constructed of bits of knotty wood and richly trimmed with bright green faux-moss, this crafty little cottage brings whimsical homespun fun to your garden. Weight	1.1 pounds. 7.5" x 5.38" x 8". Eucalyptus Wood, Plywood. UPC Number: 849179014230.